Can you find the werewolves before it’s too late? The tiny hamlet of Miller's Hollow is beset by monstrous enemies hidden in their midst. Organize the townsfolk and uncover the evil in disguise, so that you can kill the beasts before they claim the entire town, and bring eternal silence to the town forever. Distrust and suspicion run rampant – can you root out the werewolves and save your town, or will you accidentally murder your neighbors in this desperate hunt? Each of you will become one of the residents of the ill-fated town of Miller's Hollow. Star-crossed lovers, the police captain, and the hunters can all help hunt down the wolves, with help from the town psychic and a particularly nosy little girl. Convince your friends that you’re human, or you may wind up lynched by the very townspeople you fight to protect. And if you actually are a werewolf, band with your fellow monsters to pick off the frightened townsfolk one by one, until the town belongs to you and you alone! The Werewolves of Miller's Hollow is a party game for eight or more players. Featuring evocative art and social play, the game will have you bluffing, arguing and outright lying to cover up your identity and reveal the true monsters before you join their hideous ranks! If you love the social, murder mystery, “who-dun-it” type party games, Werewolves of Miller’s Hollow is as good as it gets. You get the best of both worlds: the fun and intrigue of a “Mafia-esque” game with the haunting theme of a village under attack by a crafty band of werewolves. The game master sets the scene: a quaint little village, maybe early 19th century New England. The townsfolk are a simple people, concerned with the day-to-day operations of keeping up with their crops and farms. One afternoon, a group of school kids runs down to the stream just on the outskirts of town to catch frogs. Suddenly, a scream splits the still air as the children scamper up the hillside to the safety of their parents’ embraces. They point trembling fingers at the woods by the stream while words like, “Dead!” and “Blood!” barely escape their quivering voices. The adults run down to the stream to find a villager lying propped against an old oak tree…torn open with open gashes covering his body from head to toe. What could have done this? Someone barely breathes the word, “Werewolf.” The hunt is on! Now each player gets randomly assigned a role. The lowly villager is the most difficult as they have no special abilities to assist in their hunt. On their side, however, is the powerful seer who gets to peek at one player’s role card during each night phase. The cunning witch also sides with the villagers whose powers allow her to revive or kill a player once per game. The skilled hunter can take a last dying shot at another player before his heart stops beating after a vicious werewolf attack. The sneaky little girl gets to peak at the conniving werewolves as they decide who their next unlucky victim will be. But beware! Each of these skilled villagers must not expose their true identities to the masses as they would become the werewolves’ next meal! The waters are muddied further by a sly cupid who ties two hearts (and fates!) of his own choosing together in a Romeo and Juliet bond of love…in life and in death! Add many more characters and nuances with several expansions. The villagers win if they kill all the werewolves. The werewolves win if they kill all the villagers. The two lovers win if they both survive! Werewolves hunt at night, and the villagers lynch a suspected werewolf during the day. Prepare your best poker face and your most cunning persuasion skills to stand even a remote chance of survival! I have played it quite a few times, and I have enjoyed it every single time. The bigger the group – the better. It’s also nostalgic (because I screwed up the very first time *I showed my card — which is a big No-No*). The basics are very easy to learn, but it gets harder to implement the expansions if you are not familiar with the new abilities/cards. I already have the expansions, but haven’t found the opportunity to play it yet (I don’t have a large group to play with normally). This game only needs one thing: A lot of people who wants to get fun!!!! This social game don’t need a table, only has cards and you need to talk and have fun! With the basic edition (this one) you get a lot of characters, but I recomend to buy expansions, with a lot of characters too and cards for differents events! It’s a cheap game, and I recomend it to you, everytime I do a party my friends and I play! 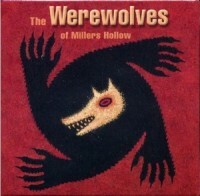 Add a Review for "The Werewolves of Miller’s Hollow"